We provide a custom dealflow process automation system that facilitates the online collection of opportunity submissions, collaboration among the buying team members and communication with sellers. Patent buyers, venture investors, M&A acquirers—let us show you how our system can remove the burden of dealflow processing and provide you with your own simple-to-use online dashboard to manage a large volume of opportunity submissions. The Dealsmiths system provides collaboration tools for team leaders, analysts and other members of your team to work together, make decisions on opportunities, share notes and recommendations. Communication with the seller, or the seller's agent are facilitated and automated. You can customize the messages that are automatically emailed to the seller as the opportunity flows through your analysis and decision process. If you're looking to run a promotion, like the IP3 patent purchase program from AST, or the promotions operated by Google and Uber, the Dealsmiths system is perfectly designed to collect the submissions, facilitate the analysis and collaboration and handle communications with the sellers. 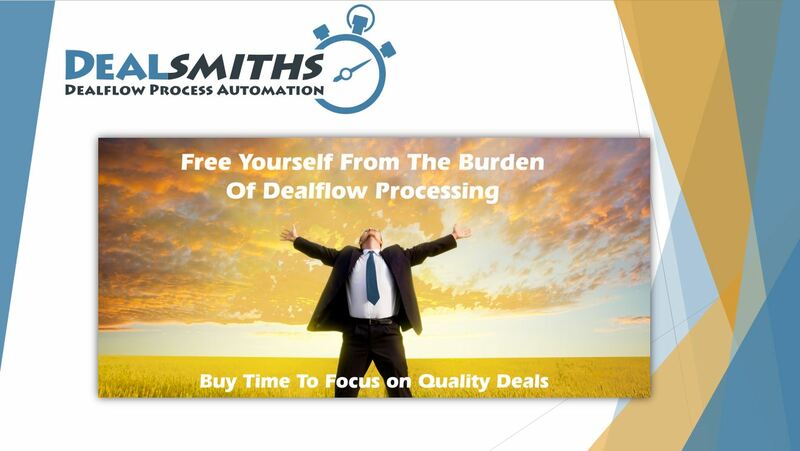 With Dealsmiths, you can focus on launching your promotion rather than spend valuable time and resources developing dealflow processing software. Reduced workload--your staff are freed up from the burden of communicating with sellers, as automated email messages keep the seller informed of the status. More time to focus on deal analysis--as they're not spending lots of time tracking the dealflow and communicating with sellers, your team members can focus their efforts on opportunity analysis. Quicker turnaround--opportunities can be collected, shared and decisions can be made quickly and efficiently as all the data is available and organized. Fewer missed opportunities--the best deals are often the first to get snapped up. By being organized and automated, you can spot the winners and respond more quickly. The secure dashboard allows buyers to review submissions, share them with team members and collaborate online. As soon as decisions are made regarding a submission, the seller is immediately notified with an email message. The Dealsmiths system provides collaboration tools for team leaders, analysts and other members of your team to share notes and recommendations. A customized tablet application provides access to your management console. With the app. and a tablet, buyers, analysts and all members of the intake team can collaborate and make buying decisions regardless of whether they're working at their desks. Dealsmiths is a business process automation software system that operates as a SAAS (Software AS A Service) subscription model. Dealsmiths is organized as a division of Cambridge Manhattan Group, a company formed in 2002 and operating successfully for 15 years. Cambridge Manhattan Group founded several companies including Tynax, a leading patent broker operating an online patent exchange. Brokering patent sale transactions for over a decade, Tynax gained a deep understanding of the dealflow process and worked with Cambridge Manhattan Group to develop the Dealsmiths system. We will be happy to show you through the system and point out how it might be used to streamline your own dealflow activities.